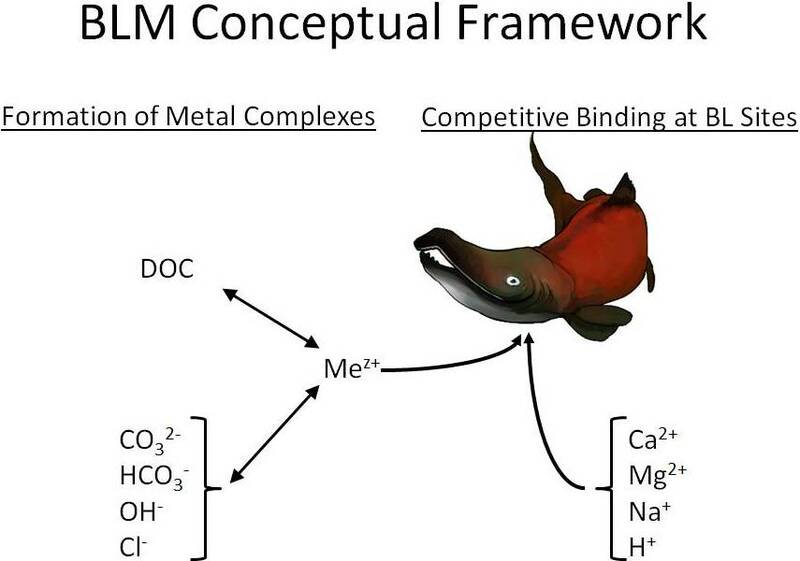 The bioavailability of metals in aquatic systems (i.e., the amount of metal that is available for uptake by organisms) is highly dependent on several factors. For example, dissolved organic carbon (DOC) in the water binds metals, cations (such as calcium) can compete with metals for uptake by an organism, and pH and alkalinity affect metal speciation (Figure 1). For a metal like copper, bioavailability is greatest in waters with low DOC, low hardness, and low pH; bioavailability generally decreases as any one of the parameters increases. Other metals, such as aluminum, have more complex speciation. For example, highly bioavailable forms of aluminum can occur at both pH 6 and 8, but less bioavailable forms occur at pH 7. The biotic ligand model (BLM) is a tool that can mechanistically predict the bioavailability of a variety of metals under the large range of water chemistry conditions that are observed in nature. The BLM is scientifically robust and defensible, user friendly, and freely available for download from this website. The US Environmental Protection Agency’s (EPA’s) recommended freshwater ambient water quality criteria (AWQC) for copper are based on the BLM. BLM-based saltwater AWQC for copper in saltwater are pending. BLM-based, environmentally protective levels for several other metals have been developed or are currently in development (e.g., aluminum, cadmium, lead, nickel, and zinc). Site-specific water quality criteria can be developed for use in determining effluent permit limits, or in state-wide water quality assessments required under Section 305(b) of the Clean Water Act. The BLM can be used to support site-specific ecological risk assessments. For toxicity identification evaluations (TIEs), the BLM can evaluate potential causes of toxicity in whole effluent toxicity (WET) tests. The BLM can also be used to evaluate the bioavailability of metal mixtures. The following are links to BLMs that are currently available for download. Please check back for the availability of additional BLMs. Santore RC, Ryan AC, Kroglund F, Rodriguez P, Stubblefield W, Cardwell A, Adams W, Nordheim E. 2018. Development and application of a biotic ligand model for predicting the chronic toxicity of dissolved and precipitated aluminum to aquatic organisms. Environ Toxicol Chem 37(1):70-79. DeForest DK, Santore RC, Ryan AC, Church B, Chowdhury JM, Brix KV. 2017. Development of biotic ligand model (BLM)-based freshwater aquatic life criteria for lead following U.S. EPA guidelines. Environ Toxicol Chem 36(11):2965-2973. Santore RC, Ryan AC. 2015. Development and application of a multi-metal multi-biotic ligand model for assessing aquatic toxicity of metal mixtures. Environ Toxicol Chem 34:777-787. Bosse C, Rosen G, Colvin M, Earley P, Santore R, Rivera-Duarte I. 2014. Copper bioavailability and toxicity to Mytilus galloprovincialis in Shelter Island Yacht Basin, San Diego, CA. Mar Pollut Bull 85:225-234. DeForest DK, Van Genderen EJ. 2012. Application of USEPA guidelines in a bioavailability-based assessment of ambient water quality criteria for zinc in freshwater. Environ Toxicol Chem 31:1264-1272. Ryan AC, Tomasso JR, Klaine SJ. 2009. Influence of pH, hardness, dissolved organic carbon concentration, and dissolved organic matter source on the acute toxicity of copper to Daphnia magna in soft waters: implications for the biotic ligand model. Environ Toxicol Chem 28:1663-1670. Bielmyer GK, Grosell M, Paquin PR, Mathews R, Wu KB, Santore RC, Brix KV. 2007. Validation study of the acute biotic ligand model for silver. Environ Toxicol Chem 26:2241-2246. Arnold WR, Santore RC, Cotsifas JS. 2005. Predicting copper toxicity in estuarine and marine waters using the Biotic Ligand Model. Mar Pollut Bull 50:1634-1640. DiToro DM, McGrath JA, Hansen DJ, Berry WJ, Paquin PR, Mathew R, Wu KB, Santore RC. 2005. Predicting sediment metal toxicity using a sediment biotic ligand model: methodology and initial application. Environ Toxicol Chem 24(10):2410-2427. Ryan AC, Van Genderen EJ, Tomasso JR, Klaine SJ. 2004. Influence of natural organic matter source on copper toxicity to larval fathead minnows (Pimephales promelas): implications for the biotic ligand model. Environ Toxicol Chem 23:1567-1574. Santore RC, Mathew R, Paquin PR, Di Toro DM. 2002. Application of the biotic ligand model to predicting zinc toxicity to rainbow trout, fathead minnow, and Daphnia magna. Aquat Toxicol 133:271-285. Paquin PR, Gorsuch JW, Apte S, Batley GE, Bowles KC, Campbell PGC, Delos CG, Di Toro DM, Dwyer RL, Galvez F, Gensemer RW, Goss GG, Hogstrand C, Janssen CR, McGeer JC, Naddy RB, Playle RC, Santore RC, Schneider U, Stubblefield WA, Wood CM, Wu KB. 2002. The biotic ligand model: a historical overview. Comp Biochem Physiol Part C 133:3-35. Di Toro DM, Allen HE, Bergman HL, Meyer JS, Paquin PR, Santore RC. 2001. Biotic ligand model of the acute toxicity of metals. 1. Technical basis. Environ Toxicol Chem 20:2383-2396. Santore RC, Di Toro DM, Paquin PR, Allen HE, Meyer JS. 2001. Biotic ligand model of the acute toxicity of metals. 2. Application to acute copper toxicity in freshwater fish and Daphnia. Environ Toxicol Chem 20:2397-2402.